The city of Gadsden in Etowah County is the starting point for the annual World’s Longest Yard Sale, a multi-state, three-day event that stretches more than 690 miles and culminates in Addison, Michigan. Gadsden was at one time in the 19th century Alabama’s second most important center of commerce and industry, trailing only the seaport of Mobile. 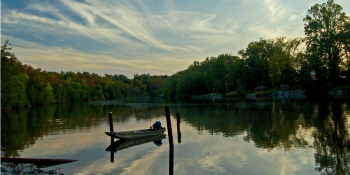 The two cities were important shipping centers: Gadsden for riverboats and Mobile for international trade. 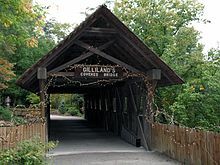 The Gilliland-Reese Covered Bridge, more simply known as Gilliland’s Covered Bridge, is a locally owned wooden covered bridge that spans a small pond nearBlack Creek in Etowah County, Alabama, United States. 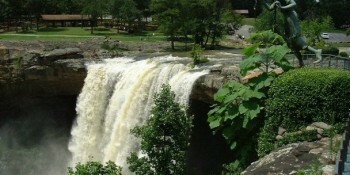 It is located at Noccalula Falls Park off Noccalula Road (State Route 211) in the city of Gadsden. Coordinates are 34°02′21.79″N 86°01′26.93″W (34.039386, -86.024147). Noccalula Falls Park is also home to the 90-foot (27 m) Noccalula Falls, part of Black Creek as it cascades down into a ravine from a ledge off Lookout Mountain. There are a couple of sources which state the bridge spans Clayton Fish Pond, but that is over a mile (2 kilometers) west of the park along a rural section of Hinds Road.